The world generates about a billion tons of garbage a year. Those who live with it and from it are the poor – like the people of Cateura, Paraguay. But they are transforming it into beauty. 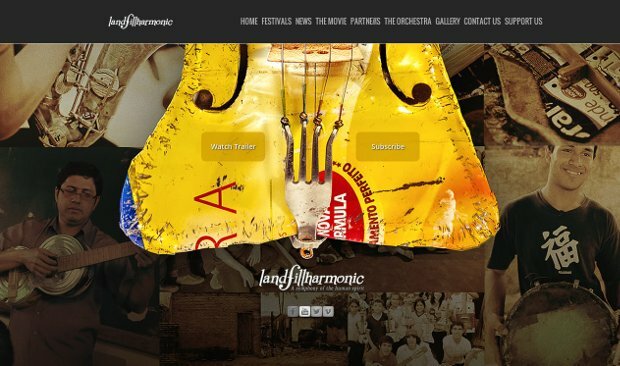 Landfill Harmonic follows the Orchestra as it takes its inspiring spectacle of trash-into-music around the world. They are of a garbage picker, a music teacher and a group of children from a Paraguayan slum that out of necessity started creating instruments entirely out of garbage. Landfill Harmonic is a story about the transformative power of music, which also highlights two vital issues of our times: poverty and waste pollution. The Orchestra had remained unheard of for many years. The launching of the Landfill Harmonic short teaser on the Internet triggered a social media events that changed this. The Orchestra has grown from just a few musicians to over 35. Their recent fame have peak the interest of the families and children of the community in such way, that many children are now enrolling for music classes. The music school of Cateura, does not have their own building yet, but teaches music and how to build recycled instruments to more than 200 kids of the landfill.